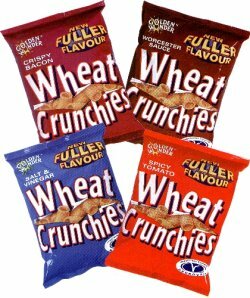 Mmm, I'm on a bit of a classics tip at the moment, and as such am eschewing the more colourful flavours for Walker's ready salted, or McCoy's. Yeah, I had a bag of McCoy's today, but I aint in the 'studio' so it doesn't count. Macc Wrote: Yeah, I had a bag of McCoy's today, but I aint in the 'studio' so it doesn't count. Have you had the rib'n'saucy flavour nik-naks? Oh, and it'll be ages before anyone spots us buggering about in here. dÃ¼ffah Wrote: oh, and it'll be ages before anyone spots us buggering about in here. I just got a box of POSR, so I've been rocking those of late. Also on a sweeter tip, Tunnock's snowballs. salted cashews or pizza shapes and savoys with spicey north african dip or spicey capsicum dip..
lments Wrote: I just got a box of POSR, so I've been rocking those of late. Also on a sweeter tip, Tunnock's snowballs. time for a visit to the..
@Macc -> gotta admire the persistence. And lo, there will forever be a snax thread in the studio forum, dedicated to studio snax! best studio snack? hmmmm. anything crisp or corn snack based gets the mouse and keyboard all greasy, so I'd have to go with pistachios. the thread of the year btw! dÃ¼ffah Wrote: and lo, there will forever be a snax thread in the studio forum, dedicated to studio snax! Same idea, different ingredients: Slice of ham dipped in hellmans mayo. Currently on the go: Heinz Ham Cheddar and pickle sandwich, mccoys cheese and onion crinkle cut and two pork farm sausage rolls.